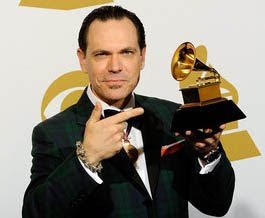 Jazz Station - Arnaldo DeSouteiro's Blog (Jazz, Bossa & Beyond): Kurt Elling & the Monterey Jazz Festival All-Stars on tour! Kurt Elling & the Monterey Jazz Festival All-Stars on tour! It will be available through February. Kurt's GRAMMY award and brief acceptance speech is at 1:20. His soulful duet with Lalah Hathaway is at 1:44. Now, bright news: The Monterey Jazz Festival is pleased to announce Monterey Jazz Festival on Tour - a nationwide, thirty-six show, six-week tour of the MJF/52 All-Stars in February and April. Traveling through thirty-three cities in seventeen states, the band features Grammy-winning vocalist Kurt Elling; the nine-time Grammy-nominated and NEA Jazz Master Kenny Barron on piano; Grammy-nominated violinist Regina Carter; Grammy-winning guitarist Russell Malone (a member of the CTI All Stars band in 2009); bassist Kiyoshi Kitagawa, and Grammy-nominated drummer Johnathan Blake. The East Coast run visits eleven states. It began on February 5, 2010 at the University of Connecticut in Storrs, and will finish on February 28 at the University of Alabama in Birmingham. The second leg of the tour begins on the West Coast in Bellingham, Washington on April 14, 2010, and continues with an additional sixteen shows in six states, ending in Detroit, Michigan, on May 1, 2010. Get your tickets soon, because these shows will sell out. (Scroll down for dates and ticket links. )For a preview of Kurt and the All-Stars performing "When I Grow Too Old to Dream," click here.